After sharing with you Part 1 of my interview with "The Biggest Loser" 4 winner Bill Germanakos on my podcast show on Monday, it's time to hear Part 2 and the conclusion of that interview during Episode 106 of "The Livin' La Vida Low-Carb Show with Jimmy Moore" today. Fans of the hit NBC-TV reality weight loss series "The Biggest Loser" are given a small glimpse behind-the-scenes of what makes this one of the most popular and inspiring shows on television these days. Bill Germanakos was quite candid during Part 2 of my interview with him about how he feels about livin' la vida low-carb. I was grinning from ear to ear when I heard him talking about keeping his carbohydrate intake to 20 percent of his total calories (WOO HOO!) and avoiding "anything white," including bread, pasta, and sugar. This was quite refreshing to hear and not surprising since every previous winner of "The Biggest Loser" has implemented some form of carbohydrate restriction to their diet. In Part 2 of my interview with Bill Germanakos, he also talks about what kind of sweetener he uses instead of sugar (and it just might surprise you! ), the enormous benefits of resistance training and cardiovascular exercise in his weight loss success, the inherent dangers of drinking regular soda (and our host Jimmy confesses to Bill how much sugary soda he used to drink! ), as well as Bill's potential plans for the future to continue inspiring and educating the masses about getting healthy. Now that you've heard from Bill Germanakos in Episode 106 of "The Livin' La Vida Low-Carb Show with Jimmy Moore," I'm curious to hear your reaction. Do you like his chances for keeping the weight off long-term by continuing down the low-carb path he has chosen for himself? Are you intrigued by the fact that the nutritionists and trainers on the show taught him about the inherent dangers of consuming too many carbs on weight and health? Talk about it in the show notes section of Episode 106 and express yourself. 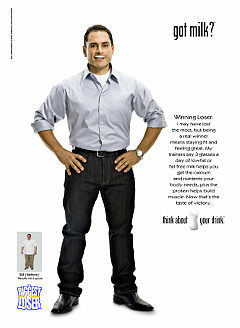 Don't forget to check out the outstanding web sites created by Bill Germanakos located at HalfTheManTwiceTheMan.com and BiggestLoserTwins.com to keep up with what is happening with the Season 4 winner of "The Biggest Loser." You can even book Bill and Jim Germanakos to come speak in your area and buy some cool merchandise from the brothers, including that CD with Sinatra favorites sung by Jim. You can listen to FREE clips from the CD, too.